Near-disaster happened decades ago. As a recreational diver, U of G chemistry professor Saul Goldman had logged fewer than 100 dives by then. One day, out with a group in a former fishing area, he entangled himself in discarded fishing line below the surface. No one in the group noticed his predicament. Yanking at the snarl without effect, Goldman watched the others swim away. He found enough play in the line to allow him to surface. With his gloved hands, he managed to snap the line. Back underwater, he caught up with his group. 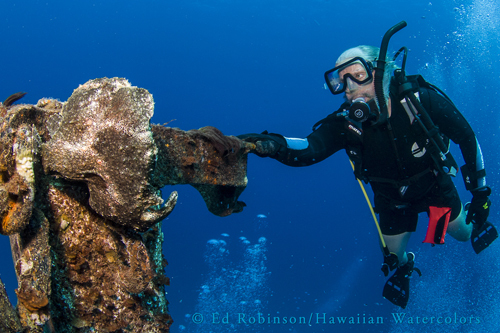 “After that I brought a knife,” says Goldman, who has since racked up almost 1,000 dives mostly in Hawaii. The emeritus professor now pursues a research project that combines underwater risks of a different sort with his career-long studies of the behaviour of liquids and solutions. Decompression sickness occurs when dissolved gases coming out of solution in tissues form bubbles in the body as divers decompress. Results may vary from skin rash and joint pain to paralysis and death. Diving tables or dive computers help enthusiasts and professionals keep tabs on depth and time underwater, reducing the risks of injury. He looked into the literature and tested equations and models. He says the result is a more nuanced model to reflect varied “washout” rates, or how fast dissolved gases leave body tissues. In 2007, Goldman published his model in the Journal of Applied Physiology. Ideally, he says, his results would yield more sophisticated tables and devices. He has discussed his work with international groups, notably the Undersea and Hyperbaric Medical Society and the South Pacific Underwater Medicine Society. Those groups include divers and physicians. Using hyperbaric chambers delivering oxygen at high pressure, doctors may treat not just decompression sickness but ailments including carbon monoxide poisoning, radiation damage from cancer therapy, slow-healing wounds in diabetics and burns. Working with Defence Research and Development Canada, the U of G chemist is now looking for blood biomarkers to help doctors diagnose decompression sickness. Goldman and post-doc Juan Manuel Solano-Altomirano also study blocked blood flow in divers in research funded by the Natural Sciences and Engineering Research Council. The Guelph professor began diving at around age 35 during a Caribbean vacation. Long certified, he has logged almost 1,000 undersea dives, mostly in Hawaii over the past 20 years or so. He found a whole new world undersea – manta rays, sharks, coral and nudibranchs, or soft-bodied mollusks with often bizarre forms and colours.